There's an old translator's joke that goes something like this: If you literally translated what is said when a Japanese businessman calls another, you'd get two people constantly apologizing. Not exactly fall over funny, but it's true. The Japanese language is different from the English language in a myriad of ways: it sounds different, the written characters are different, and the grammar is different. The sentence structure can lead to sticky or simply stinky translations, and the best translations are able to retain the nugget of the original, but still shine in English. "If you do a literal translation, it sounds horrible and stilted," says Mark MacDonald, executive director at Tokyo-based localization firm 8-4 which is responsible for the English language versions of many top Japanese-made games. Stuff that may flow in Japanese does not if the words are simply flipped to English. It's necessary to inject that flow, that rhythm of English and that vibe of Western culture into localized games. That is, if you want the localization to work. Generally speaking, Japanese sentence structure is subject-object-verb, while English is subject-verb-object. That being said, Japanese language is far more flexible about word order than English and words can even be omitted in Japanese! The University of Tokyo has an introduction to Japanese grammar that's worth checking out. The cultures vary as well. It's not just the traditional bit, like the levels of politeness that exist in Japanese. It's also pop culture, points of reference, etc. So when video games are localized into English, it's not just a matter of going through games line-by-line and putting things in another lingo. Players need to be working from the same starting point, and the easiest way to center them is through language. That's only the beginning. Founded in 2005 and named after the last stage of Super Mario Bros., 8-4 is one of the leading groups translating and helping to rewrite Japanese games for a Western audience. The 8-4 team has worked on an array of projects — from Soulcalibur IV to Star Ocean: The Last Hope. Playing the Japanese originals shows just how games get tweaked for Western players. The 8-4 team isn't simply localizing the language, it's localizing the experience. In the gallery below, Kotaku compares the Japanese versions of the game with the English versions. Want to know what's different? Let's dive in. Localization isn't about simply translating words, it's about translating experiences. Good game localization takes the essence of something and distills it into another language, while evoking the same reactions in players as the original did for its native audience. In that way, game localization is different from movie subtitles or book translating. Things like user interface and even gameplay need to be taken into consideration so that even though the games may be be different, the feeling is the same. 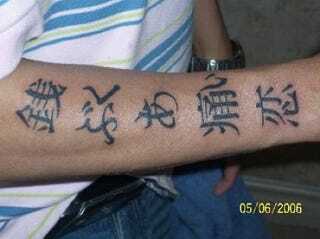 For more more info about the kanji tattoo at the top of this feature, check this post.